The dream house comes true in 45 square metres! When it comes to small homes, designers have an opportunity to be slightly more creative and innovative because they have so much less space to work with. Yet, this creativity and innovation can result in the most extraordinary designs, as we will see today in this dream home that is only 45 square metres in size. What this small little home shows is that dynamite certainly comes in small packages. Design professionals Polygon Arch & Des have risen to the challenge, using every design trick in the book to create a spacious, homely, functional and trendy house that every single one of us would love to live in. In the entrance to the home, we can see how different tones, textures and colours collide to create a very appealing home right from the get go. There are wooden floors as well as patterned white and blue linoleum floors, which separates rooms according to their functionality. A range of trendy artwork has been hung on the wall like a collage, drawing in the eye in. This distracts us from the fact that this room is actually quite small. The long, narrow mirror hanging on the wall is not simply to check your outfit before you leave the room. It also adds depth to this space, making the home look that much bigger than it really is—a great design tip! While this is essentially one room, we can see how a kitchen, dining room and little breakfast nook all fit into this space with plenty of room! 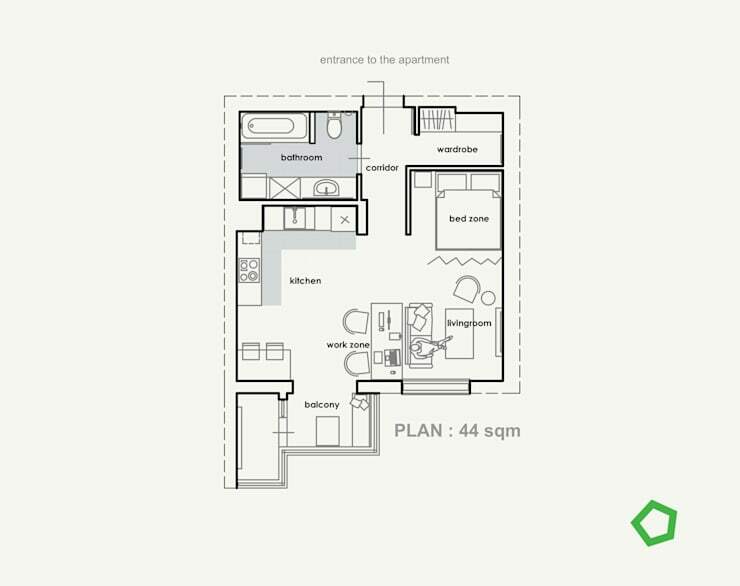 The space is very multi-functional, with everything that you could possibly need from a living space right here! But how have the designers managed to achieve this? 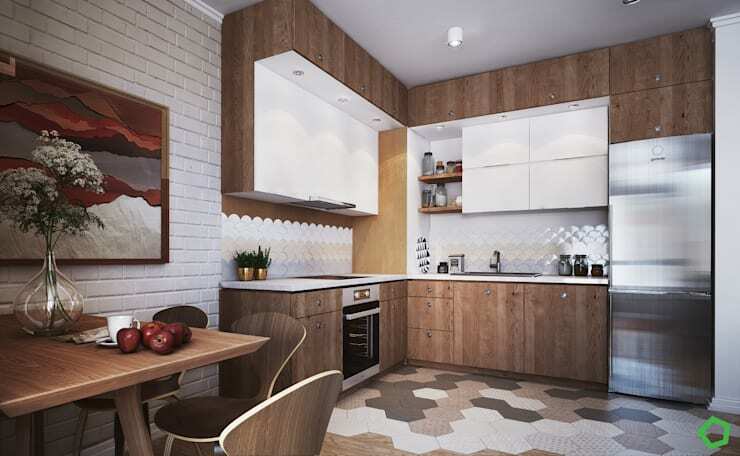 Well, in this image, we can see how the flooring clearly distinguishes the kitchen from the rest of the living space. This is a great tip, because it allows space to be separated without having to build walls. Walls tend to constrict spaces and make small homes feel very cramped. 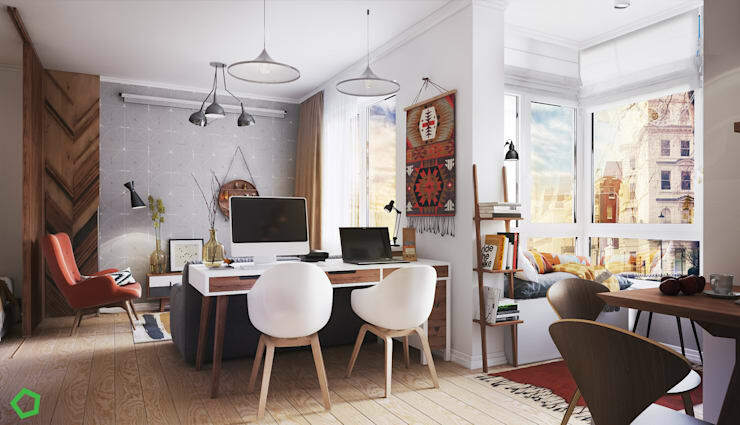 Have a look at these other tips for: How to stylishly split a room without a wall. 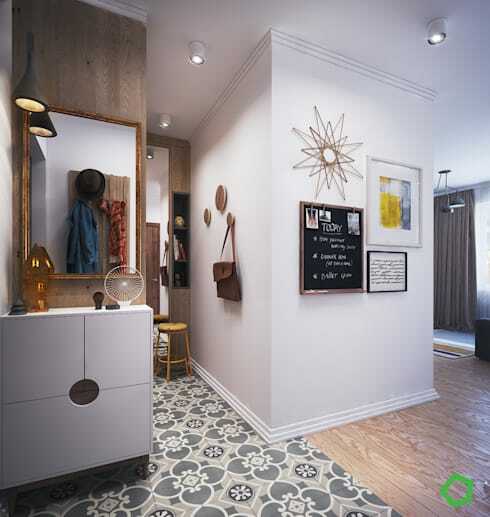 Another way that these designers have maximized every centimetre of this space is by utilising the corners. 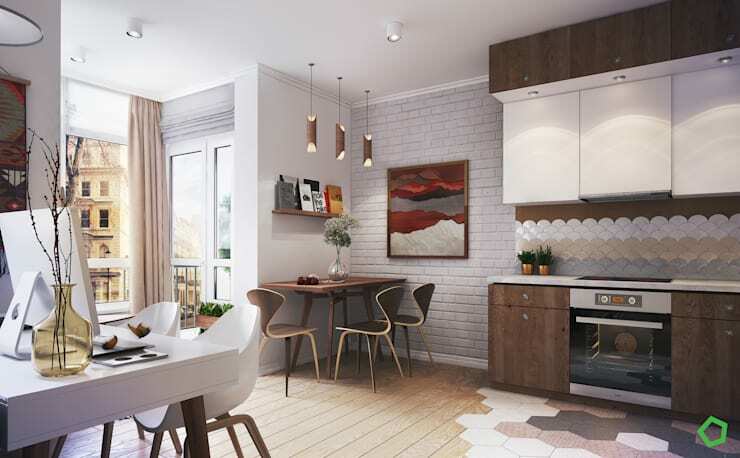 In the kitchen, we can see how they've adopted an L-shape design, ensuring that the floor area is spacious, with plenty of room for cooking, making tea and whipping up delicious baked goods. We can also see how the L-shape design ensures that there are plenty of cupboards, drawers and cabinets. This keeps the kitchen looking minimalist and neat, which is crucial for a small space. In fact, you'll notice that the counters only have the most functional of items on display, everything else is stored neatly out of sight. The warm, neutral tones also contribute to a very homely and clean cut room. In this image, we can also see how the kitchen and dining room flows into the living room. 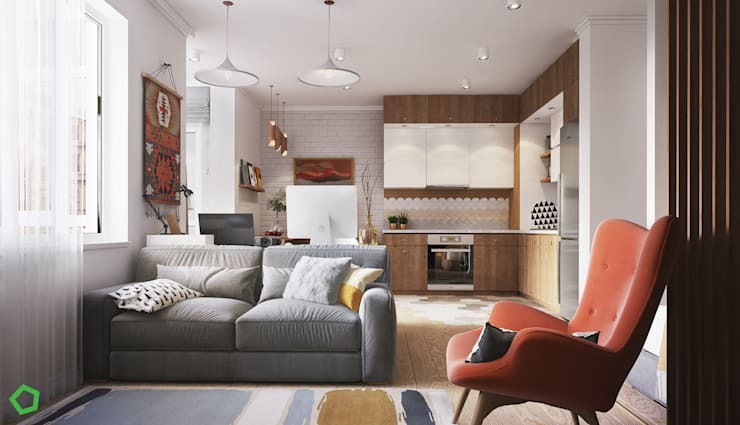 The designers have used the sofa to subtly separate the living room from the rest of the home, but there is still a wonderful synergy between the space that makes this area look very spacious. A little bit of colour and charm has also been added to this space in the form of a colourful patterned rug and a red armchair. This is a great way to subtly bring a bit of vibrancy to the interior design, without overwhelming it. It also distracts the eye so that you are less aware of the space constraints. Tip: Add some lamps to your living room to illuminate the details of the design in the evenings as well as create a wonderful soft glow. This will result in such a cosy effect that you'll barely notice just how small this area is. Even a library and study! The designers have even managed to fit a library and study area into this little home, slotting it behind the sofa. By using lightweight furniture and a long, narrow shelf, this a perfectly functional space that can be used by two people. Don't you love how the tapestry on the wall introduces a bit of charm and personality into this area of the home? If you can believe it, the designers have also managed to create a multi-functional space out of the bathroom. In this image, we can see how they've fitted in a whole laundry area into the small bathroom area. The washing machine is slotted into a space underneath shelves, while cupboards and drawers provide plenty of storage space in the bathroom. This is a great place to keep towels, detergents, clothes and other items neatly out of sight. What's important about this is how smart storage solutions contribute to a very effective and sleek design in a small home. Have a look a these other: Really clever storage solutions for small homes. 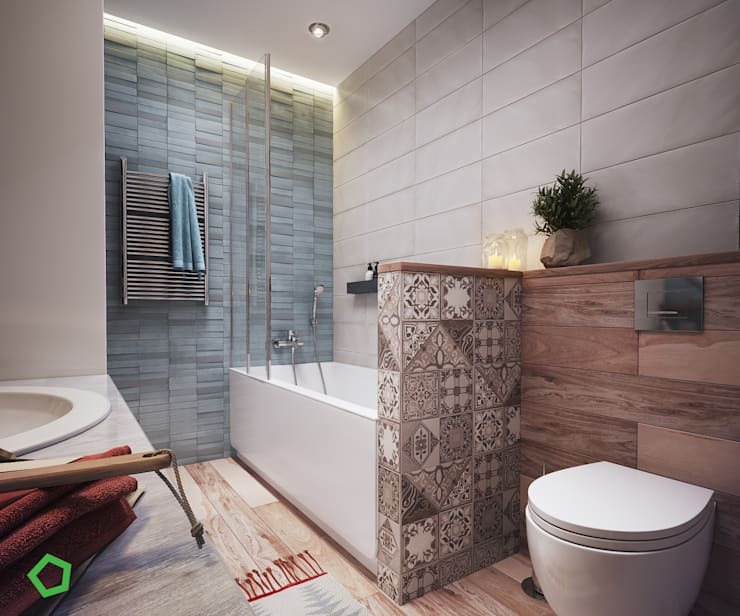 From this angle, we can also see how the designers have managed to fit a bath, shower, toilet and basin into this very modern and trendy bathroom space. 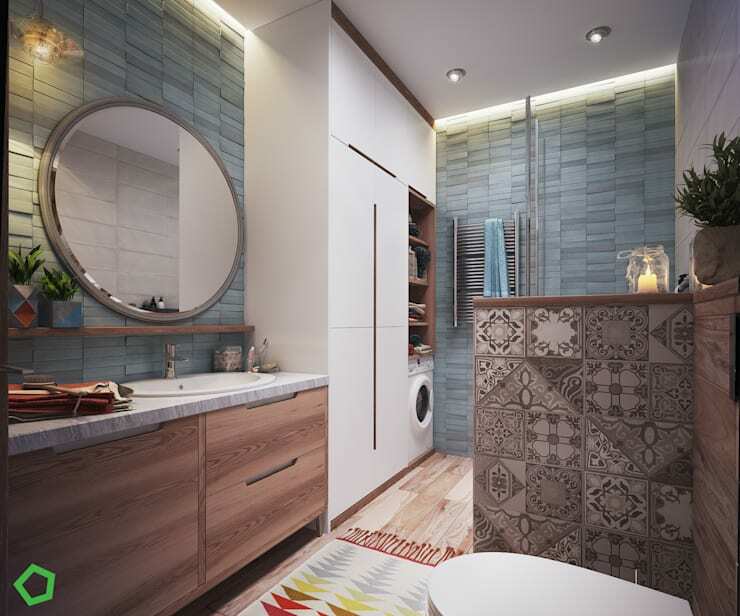 You'll also notice how there are different textures throughout the bathroom, including wooden floors and wooden cladding, blue tiled walls and patterned tiling on the wall above the bath. These contrasting textures once again divert the eye, making for a very visually appealing look and feel. The designers have also added a little pot plant into this space, which introduces a little touch of nature into the room. It's the perfect natural form of decor! In this image, we can see how the designers had a very clear plan in mind for this little home. With a clear plan, they've truly been able to maximise the space available to them. This goes to show just how important it is to work with an architect professional to make the most of the home's specifications. For more tips and tricks, have a look at these: 15 ways to make a small living room feel huge.